Kelly Rae Roberts' unique and compelling art inspires all women to shine in all that they do and all that they become. This delightful treasure will be received with a bright smile by women embarking on new ventures, honoring friendships, and igniting dreams. The engaging paintings of popular artist Kelly Rae Roberts illuminate this colorful celebration of hope, faith, kindness, courage, and gratitude. Inspiring quotes and reflections of possibility invite readers to explore their personal adventure of life and joy. 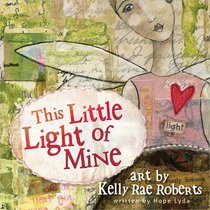 About "This Little Light of Mine"
Kelly Rae Roberts is a highly successful mixed-media artist, author, and a self-described "possibilitarian." Her lighthearted and engaging art inspires many fans who have discovered her through her stationery, gift, and home décor products. She mentors thousands of artists through her popular blog and e-courses and remains committed to encouraging others to find their passion.